I really like the Explorer II polar with the older red 24 hour hand 16570. What was the last serial code in which the red hand was produced? Also, when was the 3186 movement started on the Exp II? Good questions. I think there are some V serial 16570 latest. And the 3186 started showing in some Z or M serial pieces. An expert will be along shortly to verify my thoughts. Thanks turbo. Any other thoughts out there? Rolex doesn't start or stop anything based on a serial number, nor does anybody know how Rolex allocates serials to different models, so actual statistics are not available to the public.. I did some research on this before I bought my 16570 last year. The 3186 movement started appearing in the Z series, but not all Z's had the 3186. Mine is a G series, but I have also seen some 16570's in the random (8 digits) series. you MUST make sure to check out both the latest (Random) and V serial as there are IMO BIG differences in the last generation dial comparied to the second last.. 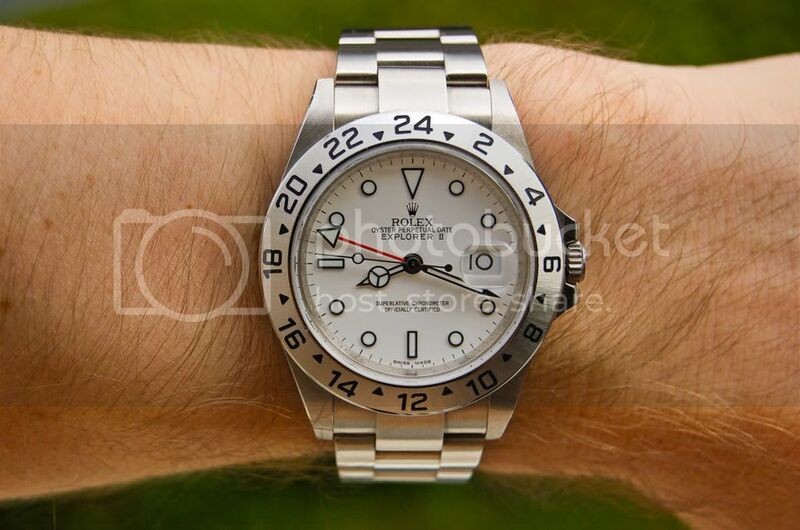 So it turns out that sometime after V or G, and definitely for the Random series, Rolex changed the thickness of the hour indices markers on the now discontinued etc Explorer II 167570, from thick to thin. What do you guys think? Does this make sense? Cutting down on material saves cash, it's like stripping out a car.. and why spend resources on something that is no more.. If I remember correctly, caliber 3185 went out of production in April 2007. And since there was a time lag the caliber 3186 based Explorer IIs was at ADs during the autumn/winter of 2007. They were late Z-serials. I got an M0-serial in February 2008 and it has caliber 3186. Ref 16570/3186 has been seen with serials late Z, M, V, low G and some random. It may be worth noting that the very last white Explorer IIs had slimmer black indexes compared to the earlier, allowing for slightly more lume. But you need to know what to look for... (minor differencies as usual with Rolex from time to time). Do a search on chrono24.com and you will find several new ones. Edit: See Puffy's post above on the dial! The thin dial is definitely noticeable. It's Espresso, not Expresso. Coffee is not a train in Italy. The M series 16570 I purchased in 2009, has the serial number on the rehaut and case. A side note reference the case serial no. has T stamp indicating it is transitional. Wether this indicates the early transition from 3185 to 3186 movements or transition to SEL? This watch has the 3186 mvt. The 16710 GMT I have is fitted with the 3185 mvt and both keep exceptionally accurate time. If it's a 16570 with 3186 movement, the M serial # and above should get what you are looking for. Many of the trusted sellers here can probably easily source one for you. I´ve just bought a Z-Serial 16570 BNIB and it has also this thin framed dial! I´ve just bought a BNIB 16570 Z-Series and it also has this "thin-framed"-Dial! True. T-case = non-drilled through lugs. Nothing else. I have already taken it to my bank safe therefore I can't show you pictures of it at the moment, but I can confirm for sure that it is a Z-Series watch dated on July 2012.
i have a sub LV MK2 with a MK3 dial.. But Puffy, I think these ones are then very rare ones, aren't they? Interesting. Could it have been originally delivered during 2007/8 with a black dial, and had a recent white dial added later. Still new, but not originally delivered like that? A lot of (unsold) watches are changed by ADs, with new dials for example. Not unusual on DJs. The date of sales is obviously July 2012, since you got it then, but the watch itself could have been produced earlier and then had a new dial installed. What is the first number after the "Z"? Do it have caliber 3186 or 3185. Engraved rehaut or not? Just curious! And eager to learn more. I purchased my Black 16570 from an AD in late 2011, but don't have an earlier 16570 to compare it to. Do you think the narrow indice markers are a trait on the black ones? Or is it a change that only affected the polar ones? not heard of this story..
if you look at early LV dials the lume is almost chipped and looks like skimmed milk, this was fixed after D.
My dial has these 'imperfections', not flaws in my eyes..
the LV i bought was off the original owner (his name on the papers) and he confirmed to me he never had it touched by anyone. he wore it as part of a huge collection and once a piece started running off time he'd sell it! But these ones like my Z-Series with thin-framed Dial or your Mk 2 LV with Mk 3 Dial should be ultra rare, shouldn´t they?